This recipe is chopping, blending, and mixing, very simple. I completely forgot the raw beet, thus had to forgo it, not sure I missed the sweetness, but perhaps it would have added another component I'm overlooking. 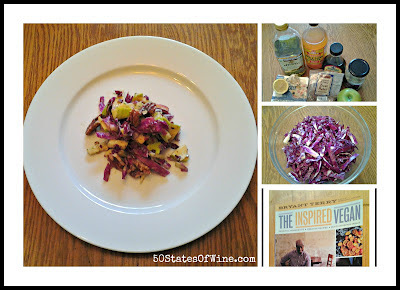 Beyond the cabbage, beet, pecans, and apples, the remaining ingredients are placed in a blender together to create the dressing. Bryant suggests layering the cabbage with thin slices of apple, creating a vertical salad. I chopped the apples rather than slicing. I then put everything together in a bowl, massaged for 3-5 minutes, then served. Really yummy! So simple and good, really should try it with the beets! THis looks and sounds really good! I love cabbage, and with apples!